Kim and I went on the Stake Pioneer Trek the other Saturday, and here are a couple pictures. 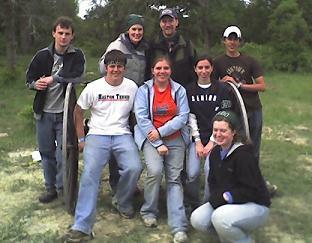 It was at Sid Richardson Scout Ranch which is about 40-50 miles away from us by Lake Bridgeport. It was just a one day thing, and a far cry from what we did when I went on Pioneer Trek (back in the good old days,) but it was pretty fun none the less. 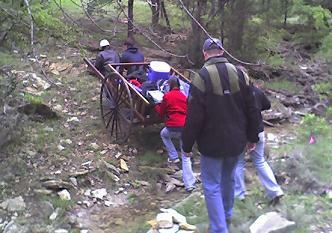 They pulled the handcart along a trail stopping about every 20 minutes for a little pioneer activity and/or story. The novelty of pulling the cart didn’t wear off like it does when you’re pulling a cart all day every day on a week long trek, but hopefully they were able to get at least a little taste of what it was like. Our little “family” was pretty cool, and I think they had a good time.